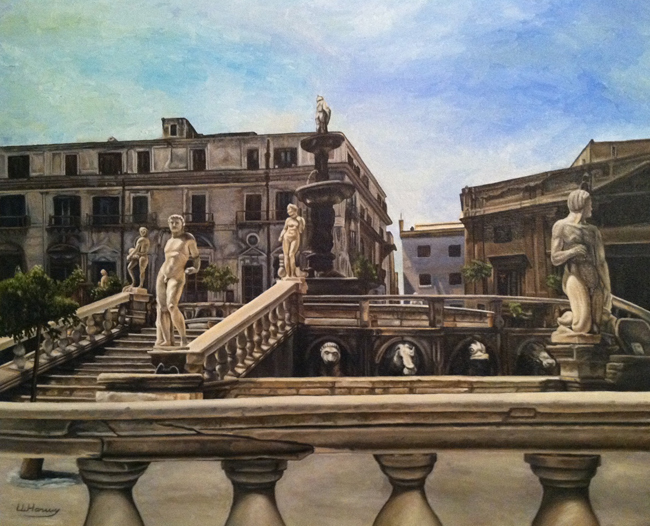 Since visiting Sicily to watch the 1990 World Cup I have been visiting ruins and historical sites to make drawings and that to expand into oil paintings. 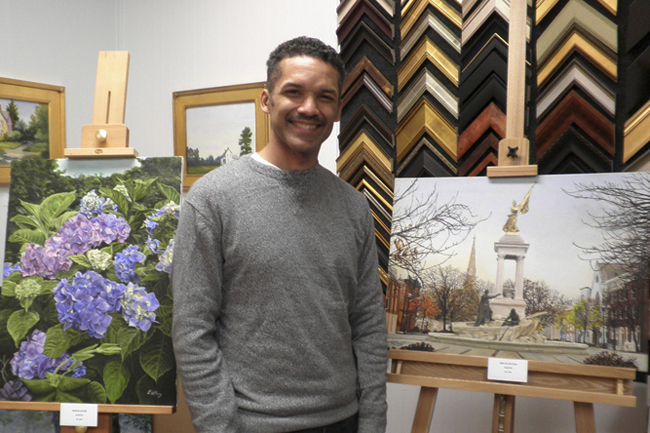 I began painting landscapes with more conviction in 2008 and attended plein air compatitions in Annapolis, Cylburn Park in Baltimore and Olney Maryland. Here are two of my paintings that were on display at Christine Daniels Gallery in Easton Maryland in 2012. The final of a series of impressive temples on the acropolis of Akragas in Sicily. Akragas was a Greek city that sided with Carthage during the Punic Wars. The Great Harbor at Sircusa (Syracuse), Sicily. Remains of Union Dam on the Potapsco River at the Rt 40 bridge. 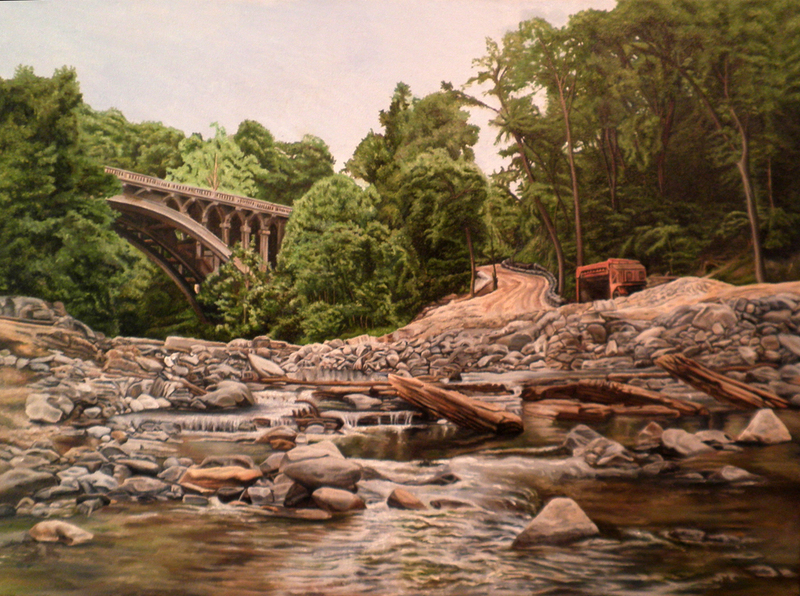 Titled "The remains of Union"
Union Dam in 2008 shortly before demolition, this painting has been sold, but high quality prints are available. 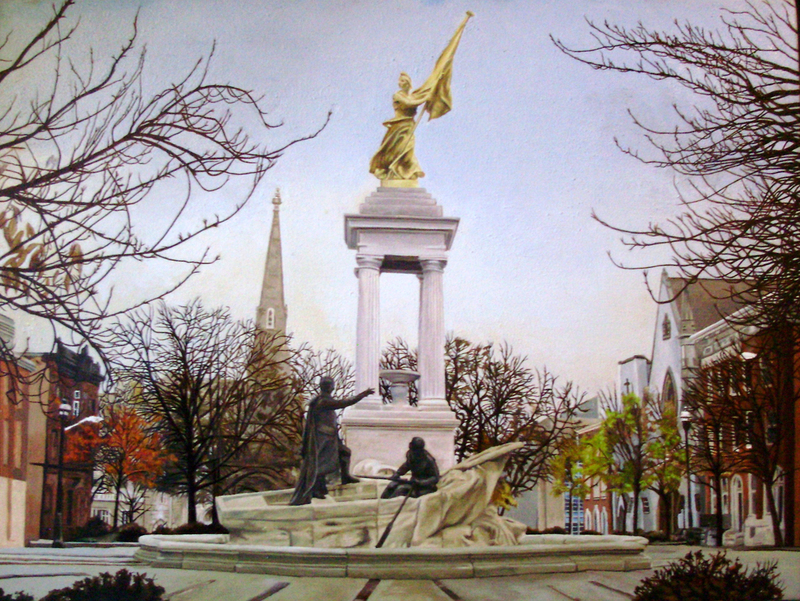 Francis Scott Key monument in Bolton Hill. Titlted "Key to Victory"
The horse trough at Guilford and Mt Royal with super max prison in the background. 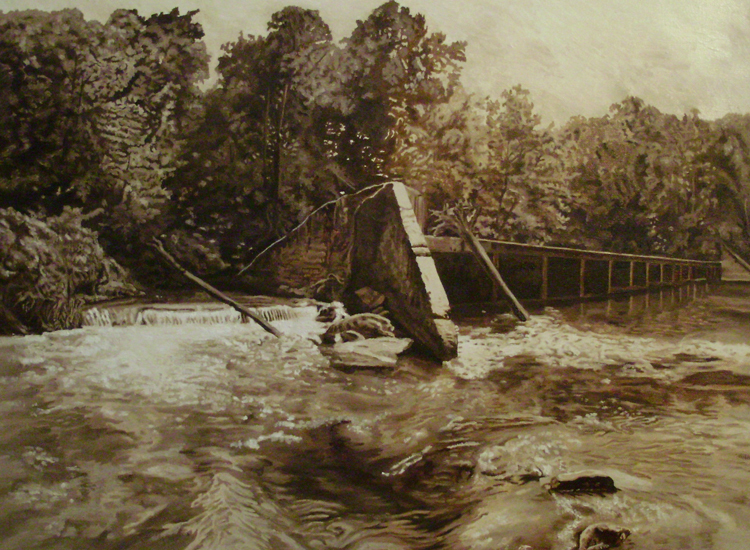 This is the first Baltimore landscape that I wanted to paint after leaving the Sun in 2009, I completed an underpainting, but took about 4 years to get to coloring it. 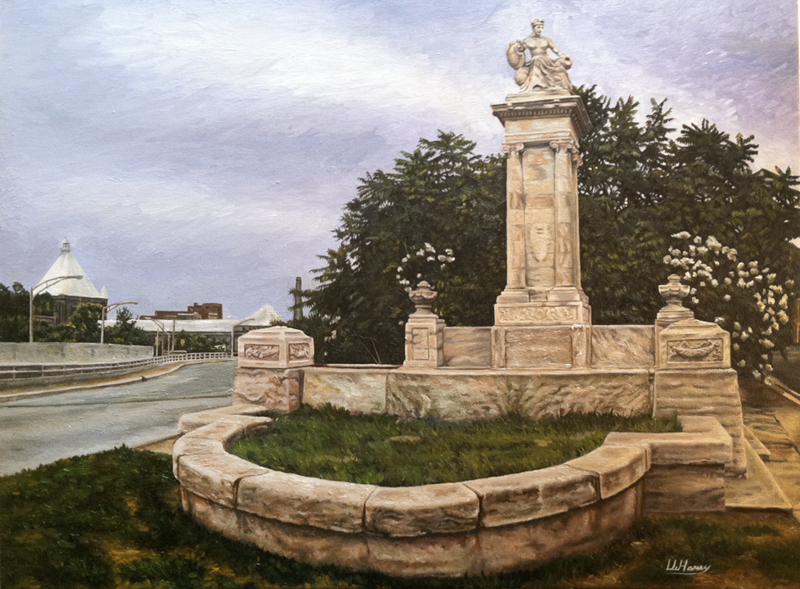 The monument was much better cared for in summer of 2013. When I posted the image on Facebook one of the caretakers invited me to do a followup. While standing on the corner of Mt. 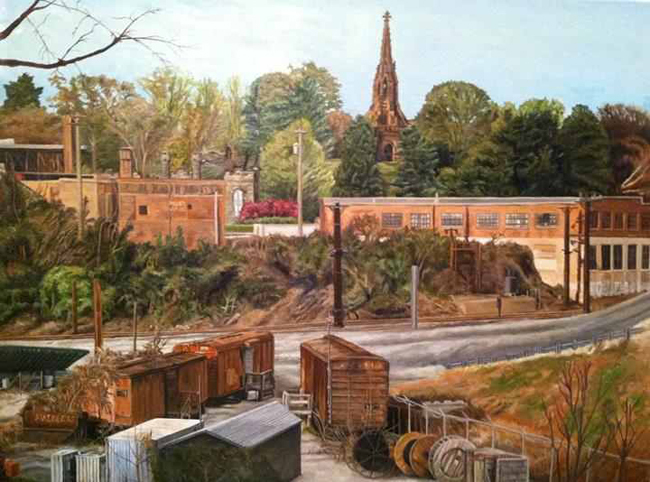 Royal and Guilford, it is impossible to not noticed the astounding view of the Penn rail yard and Greenmount cemetery. 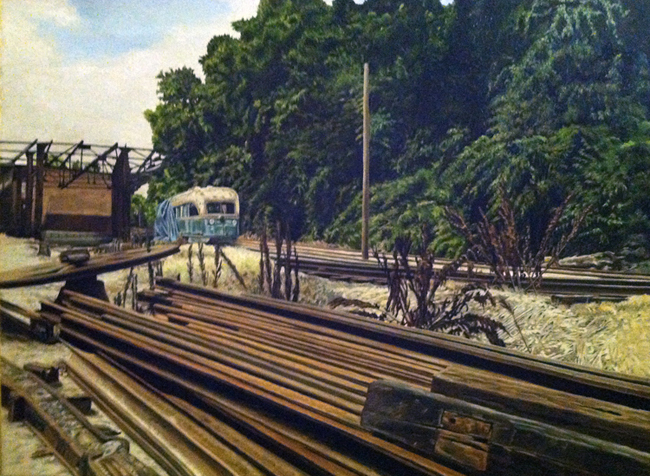 This painting is titled: "Stainless"
If you travel up the Jones Falls the Baltimore Street Car Museum is located at the old Maryland & Pennsylvania Rail station. It is often used as storage space for old rail artifacts. Here an old rusted trolly is half hidden under a tarp. Titled: Ma & Pa.
Much of my studio work is very detailed so I've been entering pleinair competitions and attending classes to work on loosening up my brush strokes. 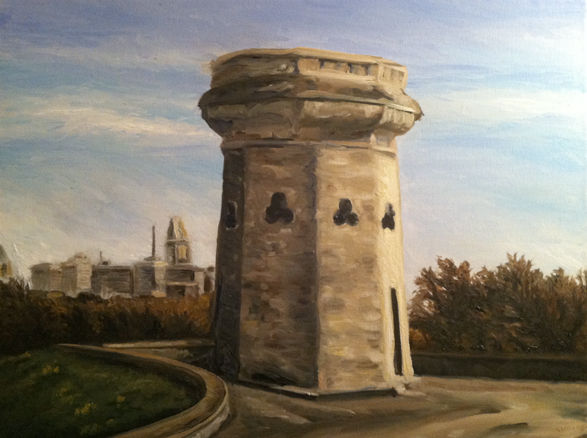 This is a painting of the Moorish Tower at Druid Hill Park in Baltimore. The entrance to the Mayan underworld temple on the acropolis at Copan. 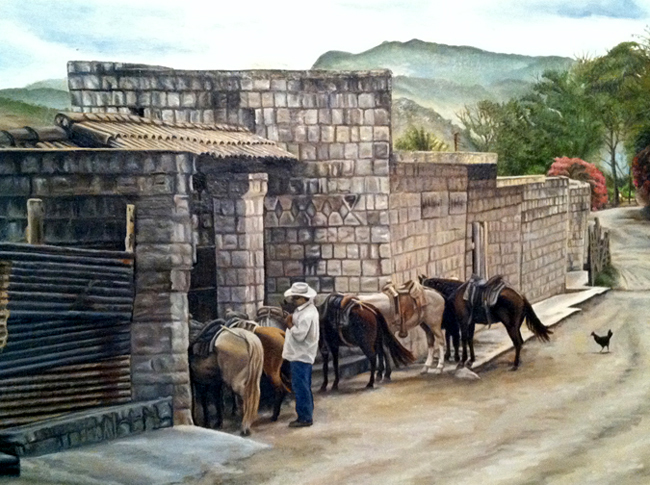 The stables in Las Ruinas De Copan. 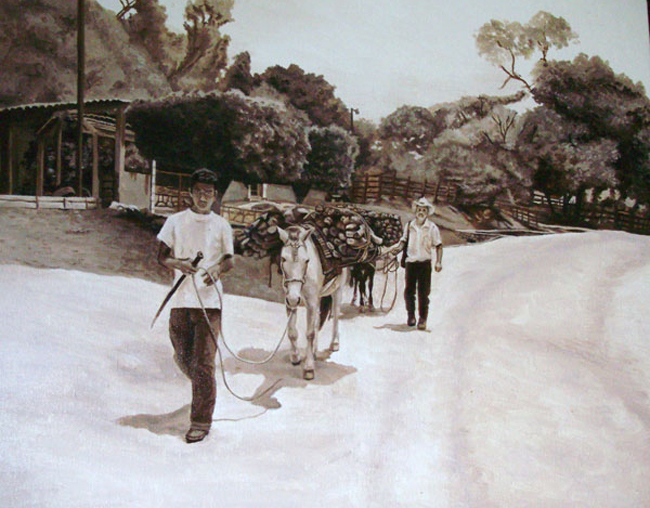 Lumber porters in the Village of Las Ruinas de Copan. 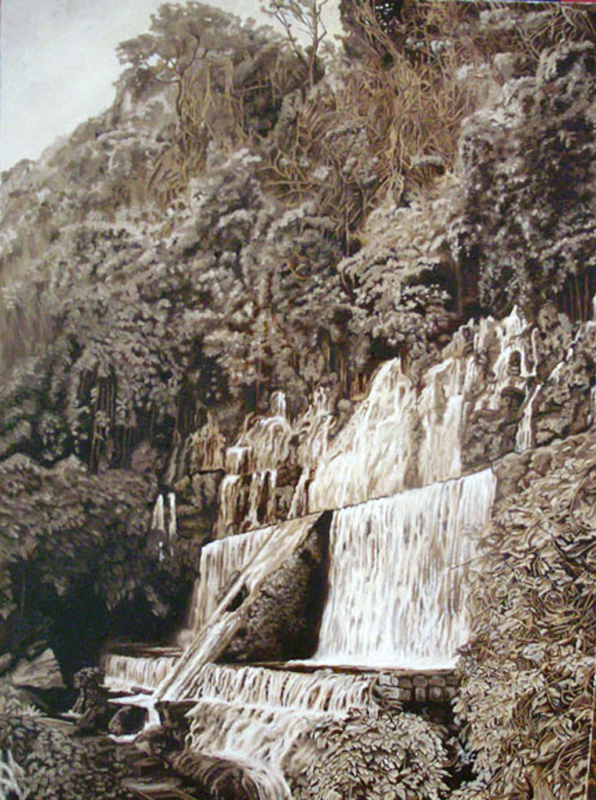 One of seven impressive waterfalls near Juayua, El Salvador. Our guide had to steady himself with the vines. I'm the only one who did NOT take a plunge on this hike. The climax of the all-day hike in Juayua is a visit to the hydroelectric dam. The water seaps out of the mountain and collects in pools. They let tourists swim in some of the pools. 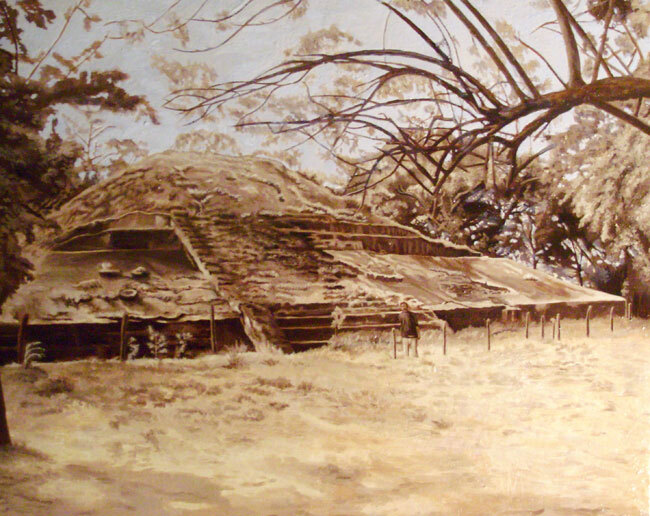 The Pyramid of Casa Blanca in El Salvador. 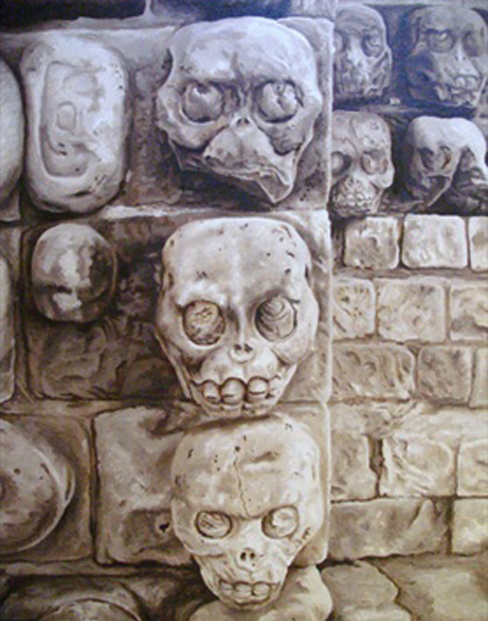 El Salvador isn't noted for its Mayan ruins, but they have them. In this case negotiating the busses took time and we could only make Casa Blanca. 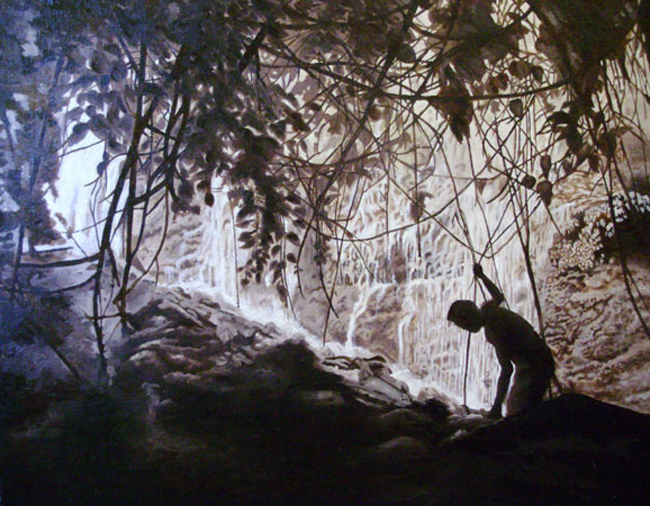 There was little little comfort for visitors, concessions, no place to get water and you weren't allowed to climb the pyramids, but it did have an archaeological dig you could peer into. I've begun adding color to this one, as with all things oil, patience is required. 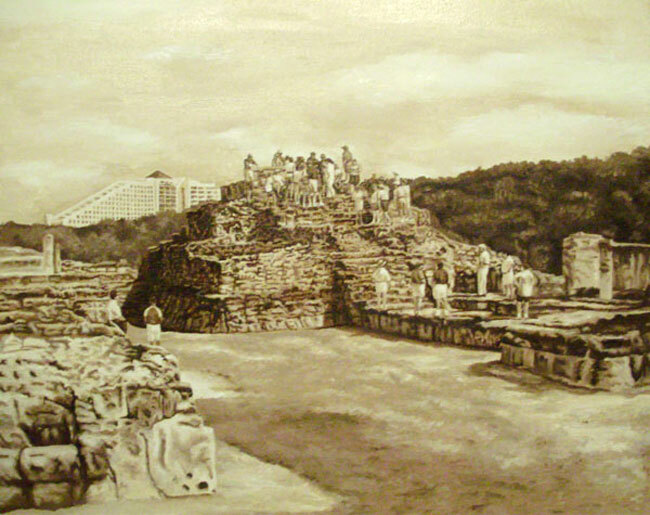 El Rey is the closest site to the beaches and thus the most often visited Mayan ruin. It is, of course, the least impressive. While Copan and Coba dwarf humans, tourists swarm over El Rey and a hotel in the distance makes it look small. The hotel is at least built to look like a pyramid.